Michael Curtis's The Dungeon Alphabet is an amazing book, all the more amazing, I think, because it made me reconsider my opinions of two artists I'd previously not cared much for. One of these artists is Jim Roslof and to say that I'd not cared much for his art is a gross overstatement. In reality, I was simply not conscious of the fact that several pieces of old school D&D art I liked a great deal had in fact been his handiwork. Unlike many of his predecessors and contemporaries, the distinctive qualities of Roslof's art never really gelled in my mind and so my cognizance of his contributions was vague and, as it turns out, largely mistaken. I'd somehow lumped Roslof in with Willingham and Dee, about whose "superheroic" style I am deeply ambivalent. Because Roslof's work is subtle and understated -- it reminds me of a more technically proficient version of Sutherland -- it doesn't leave as strong an impression, even if, at the time one is looking at it, one is struck by its attractiveness. 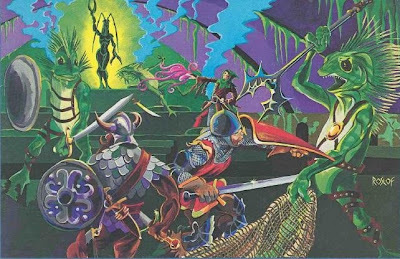 I spent a while last night looking back over D&D books and modules from 1980-1983, looking for examples of Roslof's art to post here. There was more of it than I'd recalled and, as I noted earlier, it was quite different than I'd remembered its being. In particular, I noticed that Roslof's figures tend to have "realistic" armor and weapons rather than wholly fantastical ones -- fighters almost always wear helms, for example. I'm very keen on such things myself, so it only added to my growing sense that I'd done Roslof a disservice all these years in not holding him in higher esteem. I've always liked Roslof. His work is very solid, IMO. Okay, I'll bite. Who's the other artist? Jeff Easley? Easley's paintings aren't always favorites of mine, but I really enjoy his linework. 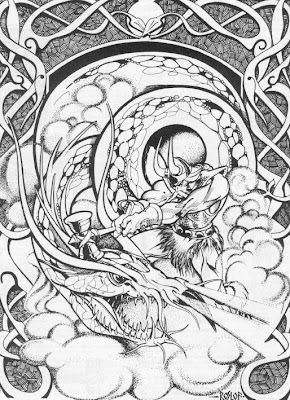 He had some great drawings in some of later 1st edition AD&D products. I agree. The funny thing is that all I usually remember about Easley are his paintings, which, like you, don't really appeal to me. His line work is in fact quite good and I'm kicking myself for not recognizing this sooner. Interesting. I was always more in the Jeff Dee and Willingham camp but I'm sure that's because I'm more "Crisis on Infinite Earths" than "Lord of the Rings" in my interests. Roslof is good, great even, though I often times prefered his pen and ink to his color work by far. I've always been a Roslof fan, but didn't know it as I sometimes mistook it for Otus (the shame!). I know some people aren't fond of it, but I've always loved the cover of the Dungeon! Board Game. It wasn't until a couple years ago that I realized it was Roslof. I'm pretty sure Roslof did my favorite piece of D&D art ever. The cover of the AD&D Character Folder with the group opening a treasure chest after slaying a dragon. That image screams D&D to me. That cover is by Erol Otus, I'm afraid (not that it's a bad piece by any means). I've always liked Roslof's stuff - and the cover of D1-2 was my favorite example of his work. Along with Willingham and Dee, these were my "Big Three" D&D artists BITD - Willingham for the illo on the first or second page of the Moldvay Basic book (my all-time favorite D&D piece as far as nostalgia's concerned); and Dee because his work in A4 was some of the first D&D artwork I had the good fortune to lay eyes upon. I never cared much for Otus - much like yourself, I regret not having recognized his brilliance until recent years. Love Roslof's styles. Yeah, plural. Easley, however, is one of those guys who gave us some of my favorite stuff in late 1e, and then seemed to degenerate later. His black-and-white stuff in "Lost Caverns" is amazing and he is, of course, responsible for what was probably the most oggled page of the Dungeoneer's Survival Guide. But by the end of 2e, he was deep in his Scary Clowns phase, which turned me off his art. It's interesting to see him take another turn in his craft. Probably my favorite after Otus, whose weirdness I always likes. I always liked that full-page drawing of Thor from DDG. I was going to plug Easley's work in Lost Caverns as well. His pen & inks in that module stand out as some of the best art AD&D ever put out (with the full page picture of Drelnza being particularly awe-inspiring). Trollsmyths comment about how Easley later fell into his "scary clown" phase is brilliantly put. How quickly he fell from grace! Jim's stuff is highly under-rated. A few years ago on the advice of a friend I commissioned a print by Jim....a redo of the cover of Q1, with my old group of player's favorite characters substituted for the ones in the original. Well, Jim blew me away. The work is detailed, looks much better than most of his TSR stuff, and was EXACTLY what I wanted. And the commission was reasonable. Thumbs up for Roslof! I have always loved Rosloff, and was greatly pleased to see his stuff in "Dungeon Alphabet" when I bought it last weekend. He has such an efficient line style that really brings a crisp quality to whatever he does. If I had a choice of who to emulate as an artist between Otus and Rosloff, Rosloff would win hands down. Just another voice saying that Roslof has been overlooked for too long. I've always been a big Roslof fan. Horror on the Hill being one of my favorites. I like his stuff in the DCCs too. I always found his work in D&DG particularly good--a good fit for Northern Mythoi. I appreciate the implied motion and depth in Roslof's images. Makes me feel like something's gonna happen! Personally, Roslov's probably my favorite of all the OS artists...sorry Erol! I'll give another shout out for Roslof. 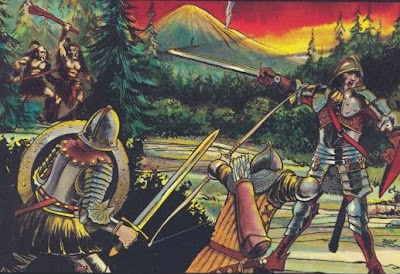 His work in D&DG is among my favorite AD&D art. I didn't like Otus back then, but then I didn't like Jack Kirby much then either! I've come to appreciate them both much more. That full-page of Thor is my favourite illustration in ye old Deities & Demigods! B2 was Roslof Keep last time I ran it. I've always had a better impression of Willingham, but that may be skewed by his incredible watercolor cover for Lee Gold's Lands of Adventure box. That's the second or third best cover in gaming history, in my opinion (the first is the Traveller black box "Free Trader Beowulf" cover, the one vying with Willingham's LoA cover is the original Vampire: The Masquerade cover, regardless of what one might think of the game itself). Is that glowing, womanly figure back there... a lobster?? That's Blibdoolpoolp, the goddess of the kuo-toa and one of Gygax's more inspired creations in my opinion. I really don't want to speculate on why a race of fish/frog-men worship a curvy crustacean, do I?